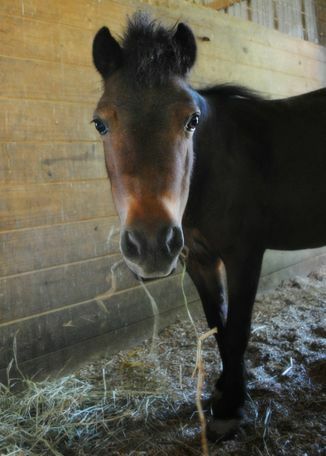 ER Kitty Hawk (“Kitty”) is a bay 2006 (approximately) Miniature Horse mare standing around 28 inches tall. She is a victim of laminitis and has rotation of the coffin bone in all four feet. At this time, she is not foundering, however she could never be turned out on grass as she is also insulin-resistant. She is available to a home that will provide her a comfortable, healthful environment to suit her needs.